As I travel around the globe I stay with and meet a lot of wonderful people. Some of those people are happy to have tasted my Super Intelligent Powerballs. I call them the Brahmananda Balls, which is a combination of Brahman (the Divine ground of all matter) and Ananda (bliss)–meaning Eternal Bliss Balls. This recipe is very versatile. You can make it pretty much any way you like, so long as a few core principles are followed. I rarely, if ever, prepare food from recipes. 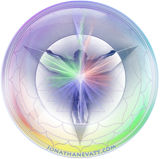 Rather I set an intent for what I wish to create and then rely on my intuitive intelligence to guide and direct me toward the natural fulfilment of that. Many folk, however, have asked for a Super Intelligent Powerballs recipe. So here is one that I put together whilst making these balls today. Once you get a feel for it, I encourage you to change it to your heart’s content. Any of the following: A little fresh cardamom powder, and/or ginger powder, and/or cinnamon powder, a little organic tumeric powder (not too much if you find the taste unappealing). So, that’s quite a list of goodies… all of which will in-form your body with a great deal of the intelligent wisdom of nature from many locations. Talk about plugging into the global consciousness of the Earth! The Himalayas, the Peruvian Andes, the Amazon jungle, the deserts of Mexico, the deep ocean waters off of the coast of Hawaii, and more. I recommend hand-chopping the nuts and seeds rather than using a little machine. Or if you have a GreenPower Twin Gear juicer, that is a great way to make your own Coconut butter and nut/seed butters. These are not exact teaspoon (tspn) and tablespoon (tbls) amounts. Meaning that I don’t smooth them off to an exact measure. Rather they are heaped, except for the liquids of course. If using Agave syrup–Use only enough to give the right amount of sweetness. I don’t suggest making them overly sweet. This detracts from the overall experience of all the other subtle and sublime flavours. 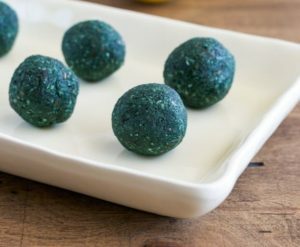 We are not making candies, but super-health-balls. You might find you can get away with no agave, or you might like to add a little raw, green, powered stevia leaf as a sweetener. Stevia has, among other benefits, the added advantage of helping the body balance its blood sugar levels! Raw honey is, I think, the best sweetener to use because it has a much higher level in intelligence. Although if you have issues with your blood sugar and need a low GI sweetener, then go with Stevia or Agave. Start with the the almond butter and coconut paste. Mix the hemp oil and agave into this, so that you get a smooth consistent paste. If you put the coconut and nut butter in later it becomes hard to mix it in evenly, especially if it is cold and hard. The spices I have listed: I often add one or more of these spices. Perhaps no more than 1/4 to 1/2 (not heaped) teaspoon of whichever ones I am using. The cayenne powder is something I like to add a little of as it gives the balls a little zing, helps digestion, improves blood circulation, and it assists the body in distributing the intelligence and nutrients from the other ingredients throughout the body. The amount of Hemp seed powder you use is simply enough to get the whole mix to the right consistency. So mix up all the other ingredients first, and then start adding the hemp powder one teaspoon at a time. The correct consistency is such that you can form the mixture into balls that aren’t so soft they won’t hold their shape, and aren’t so crumbly they fall apart when rolled and touched. Once it is all mixed up, including the hemp powder, form balls about 3/4 inch in diameter (about 3cm across). A heaped teaspoon full of mixture is usually about the right amount per ball. Obviously you can make them any size you like! I often roll these balls in any one (or combination) of the following: raw carob powder, raw cocoa powder, cinnamon powder, ginger powder, lacuma powder, and/or maca powder. Unless you plan on a late night or wish to go out partying to the wee hours of the morning, I don’t generally recommend eating these balls late at night. Some people will find it keeps them wide awake for many hours. They are very high energy! I agree with this idea in principle, and I add my own take to that. Check out whatever other articles and audio recordings you can find on this site pertaining to super foods and intelligent nutrition for further insight. P.P.S. Here is what the word Brahman is defined as: In the Hindu religion, Brahman is the unchanging, infinite, immanent, and transcendent reality which is the Divine Ground of all matter, energy, time, space, being, and everything beyond in this Universe.